Sometimes interesting exhibit supplies and show up in unexpected places. While working on a recent exhibit design project, I went in search of different types of glow-in-the-dark materials and found Sublime Stitching in Austin, Texas. 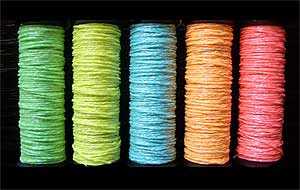 If you scroll to the bootom of the handy Tools Section of their website you will find the finely braided glow in the dark thread in a palette of five colors to fill all your fiber and phosphorescent needs! What non-traditional exhibit development resources do you use?